Tutoring Services Director Charles Haas, right, and Coordinator John Kashmer are ready to help students achieve their academic goals. The West Windsor Learning Center offers study groups and workshops. Chris, right, is an alumnus of the Nursing program who offers one-to-one academic support for current Nursing students. The Richardson Learning Center in Trenton provides banks of computers and academic tutors in a variety of disciplines. The West Windsor Writing Center opened this fall. Professor of English Ed Carmien is pictured with students. Patrick Natale is the coordinator of the West Windsor Science Learning Center. 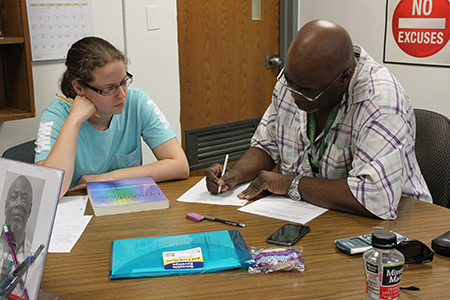 He is pictured with an advanced science student at a peer tutoring training session prior to the start of the fall semester. 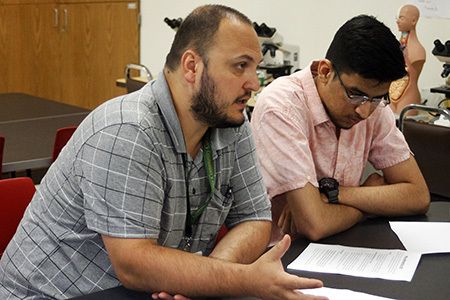 West Windsor, N.J. – For students seeking to reinforce the concepts they have covered in their classes, there are multiple resources at Mercer County Community College (MCCC) to help them get the job done. 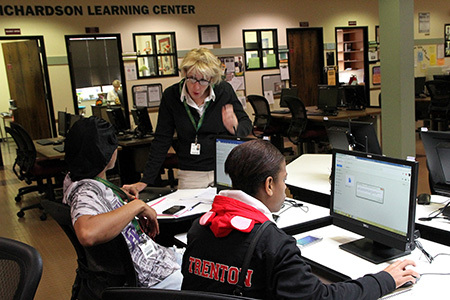 Learning Centers on both campuses are bustling places, where students can find credentialed tutors ready to serve – whether the subject matter is math and science or English and the humanities. 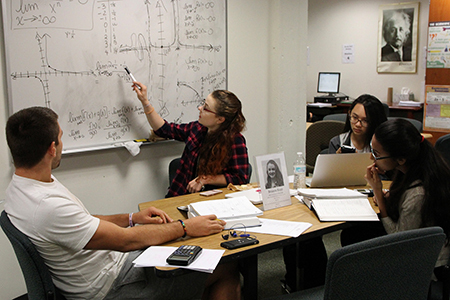 Tutoring services can be carried out one-on-one, in study groups and workshops, or online. The centers are equipped with banks of computers for students to complete coursework, with guidance if necessary. All services are free and no appointments are necessary. This fall, the latest tutoring resource opened for business in the Liberal Arts building (LA227). 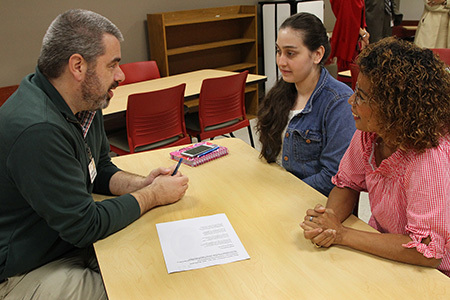 The Writing Center, a joint initiative between the English Department and Tutoring Services, is staffed by five members of the English faculty and several tutors who are devoted to writing – not only for English Department assignments but for writing across the curriculum. The center is open five days a week. According to Director of Tutoring Services Charles Haas, some MCCC tutors have been with the college for as long as 20 years. Many are retired high school teachers or college professors; some are current MCCC faculty members. All tutors, including peer tutors, go through a rigorous credentialing process with the College Reading and Learning Association. “Tutors help students prepare for exams and gain a better understanding of assignments. All of our tutors have strong skills in areas that are in high demand among our students,” Haas said. The main Learning Centers are located in LB214 in West Windsor and in KC311 (known as the Beverly A. Richardson Learning Center) at the James Kerney Campus in Trenton. Other locations include the West Windsor Science Learning Center (MS211), which opened in 2013 and has added equipment and whiteboards in response to demand. A second Science Learning Center (KC409C) opened last year in Trenton. The Nursing Learning Center (MS206) is staffed by peer tutors, a component of the curriculum for advanced Nursing students. There are also multiple links to online tutoring services. Haas speaks to a broad range of benefits. “Students gain confidence and experience a decrease in test anxiety. By working with tutors who are enthusiastic about their subject matter, students develop a love for learning and a stronger connection to the college. Essentially, we strive to create building blocks that lead to long-term success,” he said. Students have been getting the message loud and clear. Last year, the West Windsor Learning Center recorded close to 1,000 new students per semester for a total of 11,669 visits from Fall, 2016 through Summer, 2017. "Many students returned mulitple times, which is a real testimony to the effectiveness of the program," Haas said. "This was almost a 50 percent increase over the previous year." The West Windsor Science Learning Center is also proving indispensable, counting close to 1,000 visits per semester in 2016-17. While students are sometimes referred by a professor or an athletic coach, most come voluntarily and willingly. 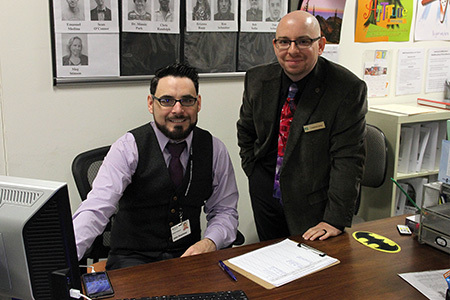 Haas and coordinator John Kashmer, who checks students in at the front desk, seek to give students a positive experience. “We want students to enjoy their time in the Learning Center and to feel that it was spent productively,” Haas said. He notes that the peer tutors are equally enthusiastic about their work. "They receive as much as they give. They have an opportunity to reinforce their own understanding of the material, to have the experience of teaching it, and to know they are helping fellow students,” Haas said. It all adds up to steady business. “That tells us that MCCC students are willing to work hard to succeed. We are doing our part to help them reach their goals,” Haas said. For all tutoring services, including subject areas and open hours, click here.